Face to face with dolphins in the blue waters of the Caribbean! We get to know these extraordinary creatures on a submerged platform and then we swim together with them in deep water, experiencing the thrill of being pulled along by a dolphin. And after this magical adventure, much more fun awaits us in the wonderful Chankanaab Park. Here we are assigned lockers, and then a qualified instructor describes the program and explains the necessary safety regulations. During the first part of the program, we come into contact with these beautiful creatures and we can even pose for a photo while we are kissed by a dolphin. Indeed, there are professional photographers around us who capture every single moment of our incredible adventure. 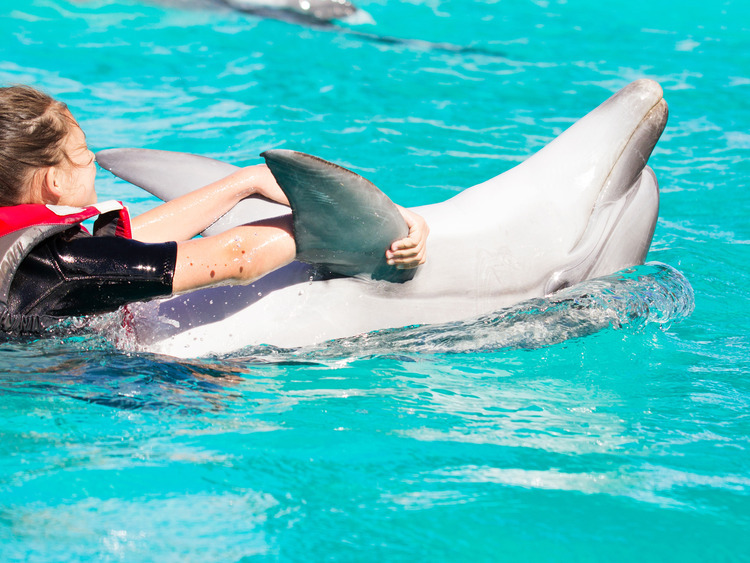 Later, we put on our life jackets and the instructor takes us into deeper waters where we experience a fantastic encounter with the dolphins holding on to their pectoral fins and dancing in the water with them belly to belly. The most thrilling moment is when we experience the sensation of literally flying over the water on a boogie board pulled by a dolphin!. This excursion does not include a guide. Our instructors will provide information in either English or Spanish. Minimum age: 8 years; minors under 18 years of age must be accompanied by an adult. Minimum height: approximately 120 cm. Video cameras and cameras are not allowed in the dolphinarium; professional photographers will take photos during the excursion. ?